When I wrote my post about the Second Annual Allegheny Ukulele Soiree, I mentioned that they had a “petting zoo.” At the “petting zoo” there were different ukuleles for people to pick up and play. They ranged from an inexpensive Kala to a very expensive Collings. 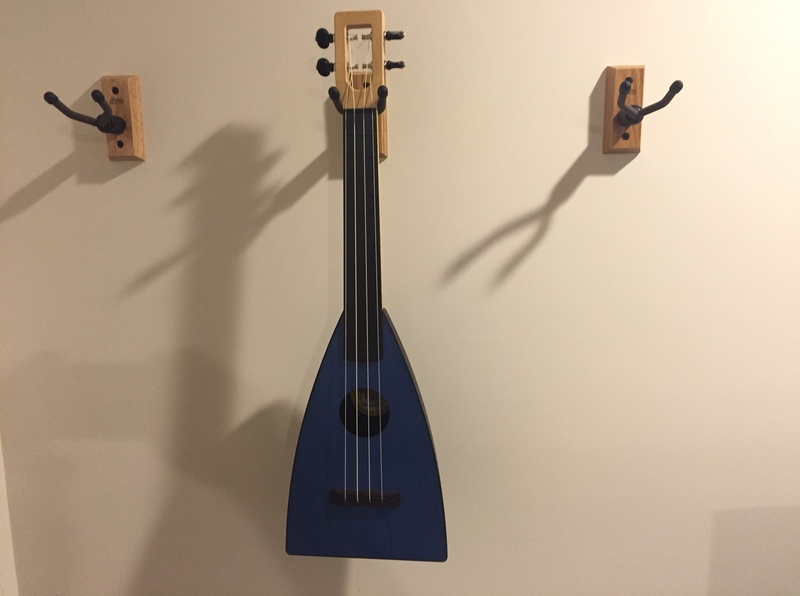 I noticed that one of the ukes was a little different looking and it didn’t need a stand. It was standing up on its own. It was a tenor sized Fluke. I gave it a try and really liked the way it sounded. I especially liked its neck which was thicker than most and it was comfortable to hold and play. This all took place in April of this year. Fast forward to October 1, the day I received my very first Fluke. It is one of many ukes made by the Magic Fluke Company, right here in the United States. A couple of weeks ago I went on their website looking for a tenor sized uke I would be comfortable taking outside to play around the campfire or on the back deck or porch. I decided to order my Fluke with a laminated blue top. The only changes I made were no white dots on the fingerboard. I added dots on the side of the fingerboard at an up charge of $2.50 each. I also ordered a gig bag and had the grip strips added on the back of the plastic back. Beth told me it would take a couple of weeks for it to be built and that is about what it took to receive it at home. I have had it for a week now and haven’t put it down. It is comfortable to play and it does not slide around at all because of the grip strips on the back. They work like a charm. The side dots are a big help when playing it. My only struggle to date is at times missing the proper fret as the fretboard is a composite as are the frets. It is all black so I can’t see the frets, only the side dots. I am getting use to it but it is different. I love the neck and the uke sounds really good with nice sustain. One of the things I wish I would have upgraded to is the Peghed geared friction tuners. It is costly, $69, but well worth it. I plan on ordering another one with a solid wood top and wood fingerboard. I will definitely get the Peghed tuners. Here is probably the one area that some will struggle with- price. I paid a little over $300 for my Fluke. Some will say that is expensive for a plastic back and laminate top uke. Especially with the stock friction tuners. I priced out a solid top tenor Fluke with the Peghed tuners, grip strips and gig bag. It came to $470 without shipping. You can buy an all solid wood Pono for that. Obviously, one of the reasons the Fluke is more expensive is that it is built here in the U.S. I will say the customer service was great as Beth worked with me to make sure I got the instrument I wanted. So, if you think about it, $300 for a custom-built instrument isn’t bad. I think of it as a cheaper alternative to the Blackbird Clara. It is a similar shape but built out of completely different materials. It is also $1000 cheaper. The choice will always come down to the consumer. What do you want and how much are you willing to spend? I have owned a Clara, which is a great instrument, but I eventually sold it as I moved up to the tenor size. The Fluke is a lot of fun to play, comfortable, and sounds really good. I like it and will probably buy the solid top version sometime in the future. I also plan on having them change out the tuners on my current Fluke to the Pegheds. If you have a chance check out a Fluke or the smaller Flea. I think you will like them as a nice alternative to a standard shaped ukulele. Until my next post, enjoy your uke!